With exciting times ahead in the region where the economy is diversifying both successfully and rapidly in order to grow, many of the high net worth UAE families are formulating impressive investment strategies moving away from the traditional real estate and oil & gas investments to relatively unknown areas such as technology and substantial international deals. All this change brings with it opportunity and risk. 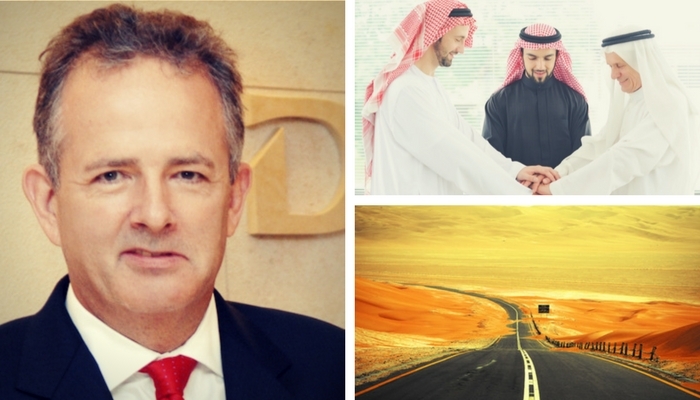 I was very pleased to be able to catch up with Steven Barlow who was headhunted from Switzerland to join the Dubai Holding Senior Leadership Team that helped turnaround the group from 2010 $6.2b loss after the crash to a highly profitable business now at the heart of the Dubai economy. 1. There is a general perception when people hear the word Governance that it is a dry subject focused on rules and regulations. Why is this not the case? Elements of governance may indeed seem dry because it necessarily involves rules, procedures and processes. However, governance is at the heart of every organization and should be viewed as a key enabler of its long term success. It not only sets the direction and “tone from the top” but also drives the whole performance culture. Get it right and the organization is more likely to operate in a smooth, effective and efficient way with roles and responsibilities clearly understood and risks effectively identified, assessed, monitored and mitigated. Get it wrong and there is likely to be a lack of clarity of roles and responsibilities, duplication of activities, and inappropriate, ineffective and inefficient decision making. Be clear and simple; communicated across the organization; and fully implemented (with appropriate monitoring and reporting). Ensure the organization is run in an effective and efficient way which delivers sustainable growth in value for its shareholders. Corporate governance is therefore not abstract and dry. It really does matter because it is critical to any organization’s long term success. 2. With so many family offices actively growing their Investment Portfolios in unfamiliar areas such as technology, why is it especially important that they implement Corporate Governance? New investments create potential growth opportunities but also additional risks. Diversification into new asset classes, unfamiliar countries and industries, and related acquisitions and joint ventures increases the governance, strategic and operational challenges. New investments and acquisitions also create additional complexity for the organization – for example new subsidiaries in different countries with different languages and cultures. The governance framework should be designed in a “scalable” way so it can be readily applied to new portfolio investments and can help mitigate these risks and challenges. The framework should not only define the decision making and authorities related to new investments but also the follow up monitoring to ensure they deliver the value originally expected. In addition, the framework should provide a key way of integrating the activities of new investments into the portfolio. New investments and acquisitions mean that new management will join the organization. They will need to understand the overall framework of control and quickly operate effectively and efficiently within it. Training and induction to ensure the framework is understood and implemented by the new entities is a key way of: a) integrating new investments into the group in a smooth way; and b) helping to align the cultures. 3. What are the challenges in implementing corporate governance in the GCC family space? Family members do not always have a consistent and aligned view of what they want their company to achieve. This can create tension and lead to decisions being challenged. There can be a lack of maturity in the core processes and controls operating in family companies. Sometimes there is not enough understanding of the benefits of enhanced Governance, Risk and Compliance. There is also a lack of resources in the GCC with expertise in Governance, Risk and Compliance and how these components should be used to design and implement a robust corporate governance framework. This lack of expertise and experience is at board and senior management level. Leading family companies in the GCC are recognizing the importance of addressing these challenges and the need for more focus on robust corporate governance. They see that there needs to be a more coordinated and holistic approach to Governance, Risk and Compliance. As a result, there is an emerging trend for ‘C suite’ positions being created whose key objective is to design and implement a robust framework which not only incorporates Governance but also Risk, Compliance and Internal Audit. 4. “Poor governance means high risk”, can you elaborate on this further? Companies which operate with poor governance are less likely to make “risk intelligent” decisions and this means there is likely to be “higher risk”. There is for example more likely to be a lack of clarity of roles and responsibilities, confusion, duplication of activities and gaps in decision making. The lack of clarity of accountability and responsibility will mean that it will be difficult to create a “performance culture”. This in turn will make it more difficult to maximize shareholder value. 5. Why does every family office need to implement robust corporate governance? Define the roles/responsibilities of the board and its committees (e.g. for setting strategy, oversight and monitoring/reporting). Provide the structure/tools to help execute the board’s core processes (e.g. terms of reference, annual calendar, meeting agendas, policies). Define the rules/procedures to make decisions and the related delegation of authorities/ “checks and balances”. Define the related information flows and interactions with management. Align the company’s stakeholders (shareholders, board, management and employees together with external third parties). Internal Audit being required to evaluate the output from the 1st and 2nd lines and give an overall opinion on the effectiveness of the processes and controls to achieve the company’s strategic objectives.